One of our stops along the way to Montana on our road trip was Boise, Idaho. I’ve shared some tips on where we stayed, along with some photos of the beautiful country between Portland, Oregon and Boise, Idaho, in last week’s Travel Tuesday post. Today, I’m sharing Where to Eat & Drink in Boise, Idaho. The top restaurant recommended to us before hitting the road to Boise, was Fork Restaurant, located in the heart of downtown Boise. Fork offers classic American cuisine, with something for everyone. It’s a family-friendly atmosphere that is modern, casual, on the verge of upscale, and very comfortable. They have outdoor terrace seating where your furry family members are welcome, too. Fork offers a delicious weekend brunch, with a fabulous Build-A-Bloody-Mary Bar, a selection of brunch classics with their own twist, including various omelets. I suggest ordering the Fried Chicken & Ballard Chicken Waffle Sliders (3 for $8.50). The chicken was tender and juicy on the inside with a slightly spiced breaded coating. The waffles were a bit inconsistent — one slider was slightly soggy, while another was nice and fluffy inside but crisp outside — but absolutely delicious nonetheless. I love that this chicken & waffles dish is served with a local orange honey butter and seasonal berry-maple syrup. My kids split the pancakes, which were perfect: the quintessential light and fluffy with slightly browned buttery edges. If you happen to visit here while you’re on a diet, and you have to allow yourself just one “cheat” item (because you have to when you’re on vaca, you know), I recommend ordering the Rosemary Parmesan Idaho French Fries ($4.95). Because: IDAHO. These fries are beyond amazing: they don’t feel greasy but they have that ideal crunchy outside (no soggy fries here, friends) and while the rosemary flavor was subtle for me, the parmesan was putting on a show, dancing on every inch of fries that would allow it to cling to. So good. Clearly, between the rosemary parmesan fries and the cheddar waffles I had with my chicken, I was pushing my now-normal dairy-free existence. But when on vacation. . .
Touted as the nation’s first restaurant distillery, Bardenay now has three locations throughout Idaho, with a fourth coming soon. They serve up tasty cocktails featuring their own distilled vodka, run, and gin, in a space that’s pretty typical of a northwest brewery or distillery: lots of wood, brick walls, old school pizzeria chairs. Their wine and beer selection is as impressive as their cocktail menu, with 15 beers on tap in addition to dozens by the bottle, and more than 45 wines by the glass, in addition to by the bottle. Bardenay’s food, on the other hand, is slightly bland compared to its selection of beverages. My shrimp satay, my husband’s grilled yellowfin tuna salad, and my kids’ grilled cheese sandwiches were okay, but the menu itself is a hodge podge of choices and the execution pales in comparison to the drink selections here. This would be a great place to meet up for drinks with friends, and I did like how kid-friendly it was. I’d love to tackle more of their drink selection sometime! As a girl who was raised in a small town, I have a soft spot for those longstanding family restaurants — the ones that have been handed down from generation to generation, whose walls whisper tales you wish you were there to have witnessed. Bonus points if it’s a diner or old-school steakhouses. The Stagecoach Inn is one of those places. After 55 years in business, the Stagecoach closed in 2014, but was revived by former manager Wanda Mariat, who currently co-owns Goldy’s Corner. Now, she and longtime Stagecoach Inn customers Fred and Francie Oliver, run the Stagecoach Inn together. The Stagecoach Inn is the ultimate old-school steakhouse. A nearly windowless, low light dining room with high back tufted banquet seats and classic steakhouse eats, this is where many famous deals reportedly were made back in the day. Black and white photos and old posters adorn the waiting area and the walls throughout the dining area. You can even catch a glimpse of the very first menu on your way to the restrooms. Like old-school steakhouses, the bar area is separate, complete with blue light back-lit bar. The food at Stagecoach is old-school steakhouse complete with 1960’s style fried prawns and basic steaks. No modern twists on classics, no crazy out-of-the-box cuisine, just good old fashioned steakhouse eats. You definitely go to the Stagecoach for the history, the ambience. Settle into a booth and laugh with friends, or settle into a bar seat and make new ones. It’s a comfy, cozy, stay late and get drunk on the past kind of place. Ala Vita – Fork’s sister restaurant, Ala Vita, serves up what is reportedly the best Italian food in Boise. Their menu is quite enticing, and if we had more time, here’s what I would have ordered: Seared Pacific Coast Scallops, theBarolo braised NW boneless short ribs, the Surf & Turf Risotto, and the Affogato. Ala Vita boasts an impressive wine list that is a good mix of Italian wines and Washington wines. 807 West Idaho Street, Boise, Idaho 83702. Saint Lawrence Grid Iron – For updated classic American cuisine, check out Saint Lawrence Grid Iron. I’ve heard the shrimp & grits are delightful here, but so are the burgers, the poutine, and sticky wings. 705 West Bannock Street, Boise, Idaho 83702. 44th Street Wineries – While many wineries are located at least 30-40 minutes outside of downtown Boise, 44th Street Wineries offers wine lovers a tasting room that features three local wineres: Cinder Winery, Coiled Wines, and Telaya Wine Co. 107 1/2 East 44th Street, Garden City, Idaho 83714. In next week’s Travel Bliss: Family Friendly Things to Do in Boise, Idaho. We will have to stop at Fork the next time we go through Boise – it looks great. 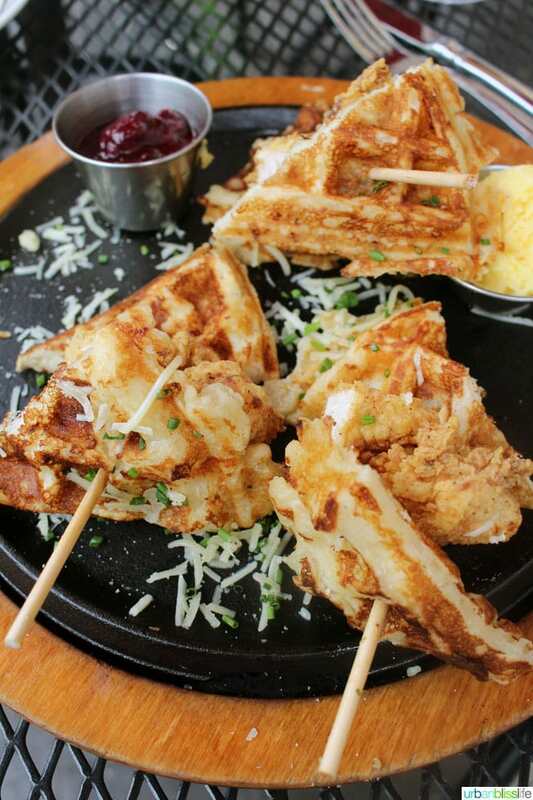 Those chicken waffle sliders look so appetizing – I’d love to have one right now! I love the idea of chicken waffle sliders and don’t see them on menus as much these days, so I was excited to see that Fork had them. They did not disappoint! You’ve sold me on Fork Restaurant–that’ll have to be my stop when I flit through Boise in a few weeks! Let me know if you go, Sabina! Hope you enjoy it! So basically all you had to say about Fork Restaurant was that they had a bloody mary bar. That will get me there every time! I’m seriously enjoying all your posts on Idaho because I never in a million years would have thought to vacation there, but now want to because it is close and seems to have some fun stuff to offer! A bloody mary bar does the trick, doesn’t it? ;) And it is easy to forget how close Idaho is to us sometimes. A fun stop on the way to many different destinations, as well as a fun destination on its own! I do too, every time I have looked at that photo during the editing process ;) They were SO good! Delicious- but even better are your pictures! They should hire you as online manager!